Home > What is M.E.? > Symptoms, Testing and Assessment. Dr Charles Shepherd, Hon. Medical Adviser to the ME Association, talks about the common factors that are believed to predispose, precipitate and perpetuate ME/CFS, in a short video that was made by ME/CVS Vereniging. Now available in hard-copy and Kindle e-Book formats! The 11th edition of our clinical and research guide is a must-have for anyone who has been affected by – or has an interest in – ME/CFS/PVFS. This authoritative publication represents the most comprehensive, evidence-based summary currently available and contains everything that health professionals and patients need to know about this devastating neurological disease. It has been written by Dr Charles Shepherd, Hon. Medical Adviser to the ME Association and Dr Abhijit Chaudhuri, Consultant Neurologist, from the Essex Centre for Neurosciences. To purchase your copy, visit our website shop, or click the image opposite. The guide is also available as a Kindle e-Book! Free copy available for health professionals! We are pleased to offer a free hard-copy guide to GPs, NHS consultants and other healthcare professionals in the UK. Please contact head office with name(s) and address details, or for more information and for any bulk orders. Centers for Disease Control (CDC) website information (2018). Institute of Medicine (IOM) Report ME/CFS 2015. National Institute Health & Care Excellence (NICE) 2007. See Introduction for more information and sources. Click the headings below to jump to each section on the page. Prominent symptoms in one patient may be quite different to those seen in others. Some patients are predominantly affected by mobility problems whereas others find aspects of cognitive dysfunction or pain to be a far more disabling component of their illness. The core symptom of ME/CFS is profound and disabling fatigue, which almost always affects both physical and mental functioning. The fatigue and other symptoms are not caused by ongoing excessive exertion and are not relieved by rest. One of the most striking and key features of this fatigue is what is termed ‘post-exertional malaise (PEM)‘ or ‘post-exertional symptom exacerbation’. Symptoms follow a characteristic pattern of variability (often fluctuating throughout the course of a day) and chronicity. Patients will often describe how they experience ‘good days’ and ‘bad days’, with fluctuations in severity being influenced by physical activity, stress, infections and temperature excesses. The key diagnostic feature of ME/CFS is the way in which symptoms worsen after activity is increased beyond what the patient can tolerate. Such activity, physical or mental, has a characteristically delayed impact, which may be felt later the same day, the next day or even later. This is followed by a period of relative recovery which may last for days or even weeks. The amount of activity that provokes increased symptoms is related to severity and in some people, PEM can be provoked by very minor exertions. Precipitated by trivially small exertion (physical or mental) relative to the patient’s previous activity tolerance: which may be accompanied by muscle aches and pain. How M.E. may be affecting the nervous system and should be considered primarily neurological. anomia (difficulty in naming common objects) and dysnomia (the inability to give objects a correct name). These problems are often referred to as ‘brain fog’ by people with ME/CFS. Cognitive dysfunction is exacerbated by physical exertion and stress and may be more prominent where there is clinical depression. Cognitive dysfunction alone is often severe enough to cause a substantial reduction in previous levels of occupational, educational, personal and social activities. Long-term memory is not usually affected, and progressive mental impairment is unusual. If this type of cognitive decline occurs, further neurological assessment must be considered. That can be persistent and difficult to control. Pain is often muscular, but it can also be rheumatic or neuropathic (where it has a burning or searing quality and may be associated with paresthesia and other sensory disturbances). Some patients may also have a fibromyalgic component to their pain. In addition to muscle pain, some people experience fasciculations, restless legs syndrome, cramp, and/or myoclonic jerks. However, a significant minority of patients experience little or no pain. A non-refreshing sleep pattern that can include both hypersomnia (early in the illness) and insomnia, reversal of sleep rhythm (especially in children), vivid dreams and ‘restless legs’. A primary sleep disorder should form part of the differential diagnosis – especially in patients where there are risk factors (e.g. BMI > 35; neck collar size 17 or above) or symptoms (e.g. excessive snoring, dry mouth or apnoeic episodes) suggestive of sleep apnoea or primary restless legs syndrome. The main symptom is usually inappropriate sleepiness rather than exercise-induced fatigue. A general feeling of ‘being unwell’ that is accompanied by sore throat, tender lymph glands and problems with temperature control (e.g. feeling feverish, sweating episodes). Autonomic symptoms are very common in ME/CFS, and orthostatic intolerance refers to an inability to sustain upright activity. Symptoms of orthostatic intolerance occur after standing up from a recumbent or resting position or after prolonged standing. They include lightheadedness, spatial disorientation, feeling faint, sweating, palpitations and fainting. It is important to identify postural autonomic symptoms in patients because they are more likely to become bed-bound due to the fact that standing up makes them feel much worse. Autonomic symptoms can be assessed using the Orthostatic Grading Scale that allows a quantification of symptoms in relation to standing. Scores of 4 or above are consistent with orthostatic intolerance. Scores of 9 and above are consistent with orthostatic hypotension. 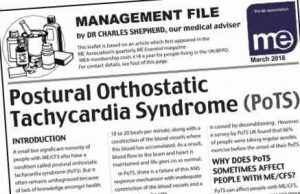 See also the ME Association leaflets on Orthostatic Intolerance and Postural Orthostatic Tachycardia Syndrome (PoTS) below. Note: Those who have postural dizziness together with a history of loss of consciousness should be assessed, diagnosed and managed according to the NICE syncope guideline (National Institute for Health and Care Excellence 2010) and the European Society of Cardiology guideline (European society of Cardiology 2009). This may involve formal autonomic testing and tilt table testing. Ideally, this should include continuous beat-to-beat heart rate and blood pressure measurement in order to detect subtle blood pressure changes. Difficulties with memory and concentration are a common and sometimes a major issue for people with ME/CFS. This download comprises two leaflets; the first leaflet covers practical coping strategies and discusses whether drugs and supplements may help. The second leaflet is designed to explain these difficulties to employers, benefits agencies, etc. Cold extremities (hands, feet and toes) are a fairly common and sometimes very disabling symptom of ME/CFS. This leaflet explains some of the causes and how the symptoms might be improved. 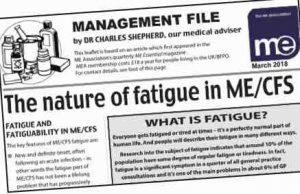 This leaflet describes the unique type of fatigue experienced by people with ME/CFS and why it is often used as a key diagnostic tool. You need to know what is meant by fatigue and fatiguability in ME/CFS and the way it differs from the chronic fatigue that occurs in a wide range of other illnesses. Headaches of a new type, pattern or severity are often reported by people with ME/CFS. Migraine headaches are also reported to be more common. Headaches also form part of the symptom list for most diagnostic criteria. 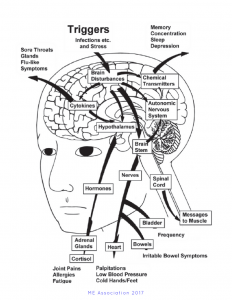 This leaflets examines the possible causes of these headaches as well as considering possible remedies. 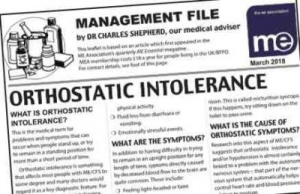 Orthostatic intolerance (OI) is the medical term for problems and symptoms that can occur when people stand up, or try to remain in a standing position for more than a short period of time. This is something that affects most people with ME/CFS to some degree and many doctors would regard it as a key diagnostic feature. For some people, OI becomes a very disabling part of having this illness. Four in every five people with ME/CFS experience pain. When it occurs, it can do so in many different forms and with varying degrees of severity. This leaflet looks at the general principles of pain management and treatments involving both drug and non-drug approaches. A small but significant minority of people with ME/CFS also have a condition called Postural Orthostatic Tachycardia Syndrome (PoTS). But it often remains undiagnosed because of lack of knowledge amongst health professionals. This leaflet is based on a Workshop on PoTS where up-to-date guidance on diagnosis and management was presented by Professor Julia Newton and representatives from the charity PoTS UK. 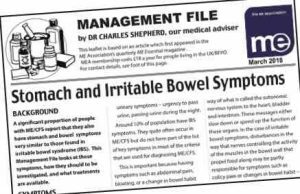 A significant proportion of people with ME/CFS report that they also have stomach and bowel symptoms very similar to those found in irritable bowel syndrome (IBS). This leaflet looks at what may be the cause and how the symptoms can best be managed. Also included is the NICE guideline on IBS and diet. Alcohol intolerance, drug and chemical sensitivities. Alcohol intolerance, sometimes complete, is a very common feature of ME/CFS, and the diagnosis should certainly be queried in people who report that they can carry on drinking alcohol without any problem. Anecdotal evidence suggests that the intolerance may decrease in people who make a significant degree of recovery. Allergic reactions: A tendency to develop allergic conditions (Straus et al 1988b) and rhinitis (Baraniuk et al 1998), as chronicity develops, has also been reported. Yang et al (2015) have reported that atopy is associated with ME/CFS, particularly in patients with numerous atopic syndromes. However, rates of positive allergy skin tests and ranges of IgE antibodies are reported to be similar in people with ME/CFS and controls (Baraniuk et al 1998). 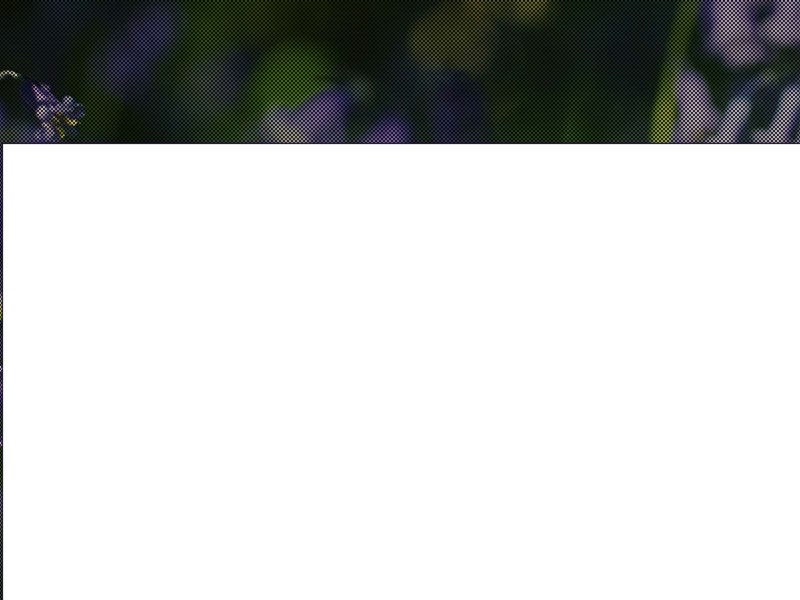 Chronic allergic inflammation is often accompanied by fatigue and patients with perennial rhinosinusitis may present with ME/CFS-like symptoms, along with headaches and disturbed sleep. Arthralgia – which may be widespread – but not including swelling, redness or joint deformity. A co-existent hypermobility syndrome should be considered in people who have joint pain. It is also worth performing a rheumatology screen and checking antinuclear antibody status. Cardiac Syndrome X: An increased incidence of cardiac syndrome X (angina-type chest pain with normal coronary arteriogram but abnormal thallium 201 SPECT scan results) has been reported. Disequilibrium and problems with balance: Feelings of unsteadiness are more frequently reported than vertigo and may be due to vestibular dysfunction (Palaniappan and Sirimanna 2002). Disturbed thermoregulation: (Wyller et al 2007): Feeling feverish, night sweats, hypersensitivity to temperature extremes. NB: Heat sensitivity can also occur in multiple sclerosis, thyrotoxicosis and as a side-effect of anti-depressant medication. Low grade fever or fluctuating fever is not consistent with a diagnosis of ME/CFS. Although ME/CFS often starts with an acute infection, a minority of people report that they continue to have low-grade fever, or spikes of fever, with no obvious cause that can be found. If this occurs, they should be asked to record a temperature diary. It should be noted that non-infectious causes of fever include collagen vascular disease, inflammatory bowel disease, thyrotoxicosis and malignancy. Unexplained fever that persists beyond three weeks should be regarded as a pyrexia of unknown origin and thoroughly investigated. Eye symptoms are quite commonly reported. These may include increased awareness or sensitivity to bright light, visual or reading fatigue, difficulty with focusing on images and following moving images, pain in or around the eye and vision-related headaches after reading. Visual symptoms in ME/CFS have been the subject of research carried out by Dr Claire Hutchinson at the University of Leicester. Headaches of a new type, pattern or severity. 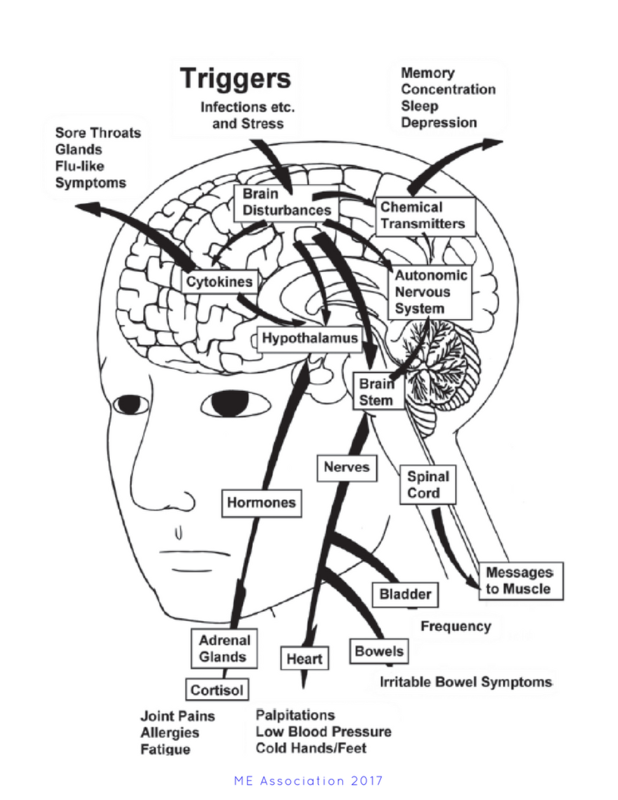 Migraine headaches are reported to be more common in ME/CFS (Ravindran et al 2011). Irritable bowel syndrome-type symptoms. But note that new onset of irritable bowel syndrome (IBS) type symptoms over the age of 50 is unusual and the possibility of other explanations should be considered. Early symptoms of ovarian cancer can include IBS-type symptoms, fatigue, urinary symptoms and back pain. Consider bile acid diarrhoea if diarrhoea is prominent. Nausea and other upper gastrointestinal symptoms (e.g. fullness and bloating after a meal) may indicate gastric motility dysfunction (Burnet and Chatterton 2004). Respiratory tract illnesses: An increased susceptibility to upper respiratory tract illnesses (Faulkner and Smith 2008). Some people with ME/CFS complain of shortness of breath and other chest symptoms. However, there is no consistent research evidence at present to demonstrate abnormal pulmonary function in ME/CFS (Ravindran et al 2013). Sensory disturbances: paresthesia and sometimes hemisensory pain or dysesthesia of the extremes. Where sensory disturbances occur as a new symptom, consideration should be given to other possible explanations – e.g. diabetes, Sjögren’s syndrome, vitamin B12 deficiency, etc. Sore throats/raised glands: Recurrent sore throats and tender cervical or axillary lymph nodes. 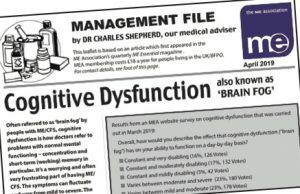 Extract from our leaflet on Severe ME/CFS – see below for details. We know how very difficult life can be when you have severe ME/CFS. We understand that even the smallest activity like brushing your hair or having a bath can seem impossible at times. We appreciate that there are times when you will have trouble talking, remembering or making decisions and how emotional all this can feel for you. We understand that you are severely limited in what you can say and do and are dependent largely or solely on others to help and care for you. We know that many people with severe ME/CFS are unable to go out and that some of you are bedridden. It can be so hard when people cannot gain the understanding they need from their family, friends and, sometimes, from their GP. Although no accurate figures are available, it is estimated that around 25% of all people with ME/CFS will be severely affected at some stage in their illness. There are serious deficiencies in the way that severely affected ME/CFS patients (i.e. those who spend a considerable period house-, wheelchair- or bed-bound) are managed in both primary and secondary care. Cognitive dysfunction, pain and sensitivity to light and/or noise can be very disabling for people with severe ME/CFS. Serious neurological symptoms can also be present. These can include double vision, blackouts, atypical convulsions, loss of speech, and loss of swallowing necessitating nasogastric/tube feeding. Severely affected patients often report different responses to management strategies that are commonly applied to people with mild or moderate ME/CFS. Health professionals must therefore recognise the need to adapt both drug and non-drug therapies to the functional level of the patient, and to adjust them further in response to patient feedback. This is particularly important when it comes to any form of management that involves physical or cognitive activity. Management of people with severe ME/CFS should also include assessment of vitamin D status, regular monitoring of weight and nutritional status, along with guidance and how to minimise the risk of potential problems (e.g. pressure sores, osteoporosis) that are associated with prolonged immobility. The 2002 Report to the Chief Medical Officer stated that the care of people who are severely affected is an urgent challenge that needs to be addressed by drawing on service models applied to other severe chronic disabilities. Sadly, although this urgent call for action was made in 2002, there has been no significant improvement in the situation. Healthcare and social service professionals are, in theory, responsible for supporting and guiding patients and their carers for the duration of any long term illness. Health professionals should therefore be ensuring access to all available support, keeping in contact, constantly re-evaluating the options, maintaining morale, enabling respite, and minimising the consequences of prolonged disease. Those with severe or prolonged illness will normally need support in their homes and communities. Local domiciliary services linked to existing primary and community-care structures are key components here. Availability of local respite care. When it comes to secondary care, there are very few hospitals with inpatient facilities to which severely affected patients can be referred for both clinical assessment and management.This dire situation was investigated by Dr Claire McDermott from the Department of Primary Care and Population Science and published in a key paper in the British Medical Journal (2014). More consideration needs to be given to practical problems faced by the severely affected when attending outpatient appointments. The situation is even worse in relation to the provision of suitable facilities for in-patient management and for domiciliary assessment of severely affected patients who are unable to travel. It should also be noted that very few of the research studies into either pathoaetiology or management of ME/CFS have ever involved severely affected patients or children – a fact that should be borne in mind when considering the general use of controversial management approaches such as CBT and/or graded exercise. Swallowing difficulties that may necessitate nasogastric or percutaneous endoscopic gastrostomy feeding. Problems with swallowing may require nutritional support through either tube feeding or through a percutaneous endoscopic gastrostomy. The possibility of coexistent vitamin D deficiency should also be considered. Research funded by the ME Association into factors that may be involved in the development of severe ME/CFS (Pheby and Saffron 2009) has shown that the type of early illness management appears to be the most important determinant of severity. Having a mother with ME/CFS was also important – possibly related to mitochondrial inheritance. Pre-morbid personality was not a risk factor, and neurotic traits were more frequent among the less severely ill. Conscientiousness overall was not related to severity. A recent study (Pendergrast et al 2016), from a research group at Newcastle University, reported that people with ME/CFS who are housebound are significantly more impaired in relation to physical functioning, bodily pain, vitality, social functioning, fatigue, post-exertional malaise, sleep, pain and neurocognitive, autonomic, neuroendocrine (hormonal) and immune system functioning than people with ME/CFS who are not housebound. The thriving ME Biobank at the Royal Free Hospital in London, which the ME Association has been financially supporting since its inception, continues to collect and store blood samples from people with severe ME/CFS who have been visited at home. This means that researchers who require samples and clinical data from this often overlooked but key patient group can now do so more economically than they would otherwise. 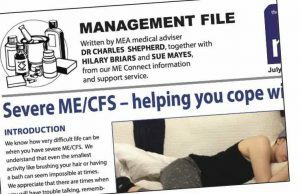 In this 12-page leaflet, we discuss severe ME/CFS – symptoms, management, care, – and how the illness can be explained to family and carers. We also consider the medical and social help you may be able to obtain. It contains a two-page checklist that you can pass on to the people responsible for your care, and severe ME sufferer, Hannah Radenkova, describes what it’s like being on the receiving end of the stigma that is so often attached to this disease. 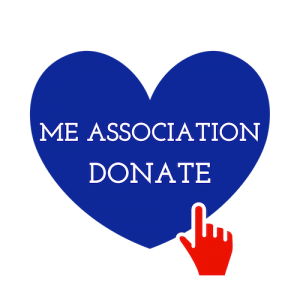 You might also be interested to read a blog we created for Severe ME Day that also listed all the resources we have available and which might be appropriate. Most medical reviews of ME/CFS state that there are no significant physical examination findings in this illness. This is then interpreted to be consistent with the erroneous view that ME/CFS is a psychosomatic condition. There are a number of more frequent abnormalities that may be found on careful physical examination, including orthostatic heart rate and blood pressure changes, joint hypermobility and a reduced range of motion. A full physical examination should always form part of the initial clinical assessment. Orthostatic heart rate and blood pressure changes may be present, sometimes at rest, but more consistently during a period of supine to upright exposure. In response to standing or tilt table testing, there is a higher incidence of neurally-mediated hypotension and postural orthostatic tachycardia syndrome (PoTS). The presence of heart rate and blood pressure abnormalities is higher in adolescents than in adults. Joint hypermobility Some people with ME/CFS also have a genetic disorder of connective tissue known as Ehlers Danlos Syndrome (EDS). This can cause stretchy and/or fragile skin, loose hypermobile joints that may dislocate, delayed wound healing and a tendency to develop early onset of varicose veins. Those with ME/CFS and orthostatic intolerance have a higher incidence of Ehlers Danlos Syndrome (Rowe PC et al 1999). Professor Peter Rowe, a leading expert in joint hypermobility and ME/CFS from Johns Hopkins Hospital, USA, has also observed that those with joint hypermobility have postural abnormalities that are thought to be a consequence of the effect of gravitational loading of the spine, including a head-forward posture, a rounded appearance of the thoracic spine and increased lumbar curvature. Height and weight – very small stature may indicate a rare mitochondrial disorder. Checking for signs of anaemia, thyroid and liver diseases and sleep apnoea. Neurological examination should look for specific abnormalities, including obvious muscle wasting, ptosis, upper motor neuron signs, absent reflexes, etc. If any of these are present, referral to a neurologist is indicated. Tests of balance and vestibular function (e.g. Romberg and Fukuda) should be carried out in patients who complain of disequilibrium. This may be due to vestibular dysfunction (Ash-Bernal et al 1995; Palaniappan and Sirimanna 2002). The NASA 10 Minute Lean Test is a simple and recommended method of assessing orthostatic intolerance. Checking skin, joints, lymph nodes for signs of systemic inflammatory disease. Tender lymph nodes in the cervical region may occur intermittently in conjunction with sore throats. New or significant lymphadenopathy requires careful clinical evaluation and may necessitate further investigation to exclude serious pathology. The diagnosis of ME/CFS should essentially be made on the typical pattern of symptoms with the exclusion of other possible conditions that can present with fatigue and general ill-health. ESR and C-reactive protein. If raised, a search for an alternative diagnosis – inflammatory, infective, malignancy, etc. – should be pursued. NB: Typically normal in ME/CFS. Haemoglobin, red cell indices and serum ferritin – which can be the first lab marker to change when iron deficiency is present – in children, adolescents and vegetarians and where there is co-existent restless legs sleep disturbance. B Low folate has been reported in ME/CFS (Jacobson et al 1993). A raised mean corpuscular volume is associated with folate deficiency, vitamin B12 deficiency and hypothyroidism. Iron deficiency could indicate coeliac disease. Vitamin B12 status should be checked in anyone (a) with neurological or other symptoms that are found in vitamin B12 deficiency, (b) who is at risk of developing any type of B12 deficiency (e.g. vegans), (c) who has an autoimmune disease or with a family history of autoimmune disease, or (d) who has an atypical onset to their illness. White cell count and differential. NB: Minor abnormalities may be present, especially during the early stages. A lowered white blood cell count can occur in systemic lupus erythematosus. Biochemical panel, including calcium, phosphorous, electrolytes, total protein, albumin, globulin, random or fasting blood sugar and HbA1c testing etc. Liver function tests – including alkaline phosphatase, aspartate and alanine aminotransferases (AST/ALT). Abnormalities in liver function tests should always raise the possibility of a separate liver problem that may also cause fatigue – for example, infections such as hepatitis and HIV, primary biliary cirrhosis and non-alcoholic fatty liver disease. Serum creatine kinase. A raised creatine kinase can be found in hypothyroid myopathy and as a result of treatment with statins. Thyroid function tests. Hypothyroidism becomes increasingly common over the age of 50, and the development of intercurrent thyroid disease in a patient with established ME/CFS is not therefore uncommon. Unfortunately, this can be missed or delayed because the thyroid symptoms are attributed to a relapse or exacerbation of existing ME/CFS symptoms. Serological screening for coeliac disease with IgA antitissue transglutaminase antibodies, especially in the presence of any irritable bowel-type symptoms (Skowera et al 2001). It is important to continue eating gluten until blood tests (and a gut biopsy where necessary) have been carried out because excluding gluten from the diet will dampen the immune response. People with coeliac disease may also have selective IgA deficiency, making this test invalid, so total serum IgA should be checked in parallel. Electrocardiogram (ECG) in adults where there is a history of chest pain – query cardiac syndrome X.
Epworth Sleepiness Score or the Pittsburgh Sleep Quality Index if there is any suggestion of a primary sleep disorder being present. Sleep disturbance is almost universal in ME/CFS, and a recent study has investigated sleep differences between 22 ME/CFS patients and 22 healthy controls using polysomnography over three consecutive nights (Gotts et al 2016a). 9.1% of the ME/CFS group met criteria for an objectively verifiable sleep disorder. Height and weight charts must be maintained in all paediatric cases of ME/CFS where laboratory tests may not always be possible. If significant abnormalities in any of the above routine investigations are found, this always indicates the need to consider and pursue other diagnostic explanations that might better explain the symptoms. At present there is no diagnostic blood test for ME/CFS – but testing your blood is essential to rule out other illnesses that can cause similar symptoms. This leaflet explains why no diagnostic test is currently available and why exclusionary blood tests are so important. Autonomic function tests (e.g. tilt-table testing) and Composite Autonomic Symptom Scale (COMPASS) if autonomic symptoms, syncope or postural hypotension are prominent. Chest X-ray if there is a history of chronic cough. Infectious disease screen if there is any possibility of chlamydia pneumonia (Chia JK and Chia LY 1999), hepatitis B/C, HIV, Lyme disease, mycoplasma, Q fever, etc. MRI scan of brain if multiple sclerosis is considered possible. Muscle biopsy if serum creatine kinase is raised or where there is progressive deterioration in muscle strength and/or muscle wasting. Rheumatology and autoantibody screen if any degree of arthralgia is prominent. Schirmer’s test if dry eyes – possibility of Sjögren’s syndrome. Some patients with chronic fatigue have dry eyes and mouth and other features suggestive of Sjögren’s syndrome. Serum 25-hydroxy vitamin D (25-OHD). Consider vitamin D deficiency in adults with restrictive diets and lack of access to sunlight. Serum estradiol and follicle-stimulating hormone if there is significant premenstrual exacerbation of symptoms (Studd and Panay 1996) or the possibility of an early menopause. Serum prolactin and neuroradiology investigations if there are symptoms that could be caused by a pituitary tumour (e.g. headaches, eye problems and symptoms suggestive of prolactin excess such as acne, galactorrhoea, hirsutism, menstrual irregularities, loss of libido) or hypopituitarism (Coucke et al 2013; Hurel et al 1995). Short synacthen (ACTH) test if plasma or urinary cortisol is low with symptoms (i.e. weight loss, nausea, pigmentation of non-sun exposed areas) and if routine screening tests suggest Addison’s disease (i.e. hypotension, low serum sodium, raised potassium). Patients with polycystic ovarian syndrome may experience fatigue as part of the metabolic syndrome. The fatigue may be compounded by a raised BMI, which is a common feature. An unfavourable lipid profile – increased triglycerides and lowered HDL cholesterol – has been reported in ME/CFS (Tomic et al 2012). Please refer to the clinical and research guide for a more detailed explanation of baseline investigations and other tests that may be required. McGill Pain Questionnaire and Pain Diagram. Research into exercise physiology in ME/ CFS carried out by Snell et al (2013) and VanNess et al (2003) and replicated by Keller et al (2014) indicates that a two-day cardiopulmonary exercise test (CPET) protocol can objectively document post-exertional malaise in ME/CFS and could be used as a diagnostic biomarker. In simple terms, people with ME/CFS perform adequately or even well on the first day but have reduced cardiopulmonary function on the second day and are unable to reproduce their day one performance. use of bicycle ergometry to accurately measure work output. volume of oxygen consumed at peak exercise. Results from a single CPET can be misinterpreted as deconditioning and could therefore lead to an exercise prescription that is inappropriate or even harmful for people with ME/CFS. The objective measurements in CPET, including indicators of maximum effort, remove issues of self-report bias and the question of effort. In other words, the results cannot be faked. These results also support strong and consistent patient evidence regarding the harm that can occur using inappropriate exercise programmes. 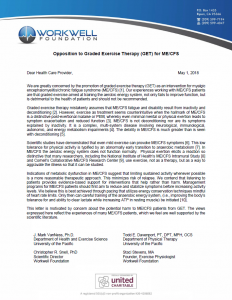 In support of the ME Association’s position on GET (that it should be withdrawn from the current NICE guideline), we include a copy of the 2018 letter from Professor Mark VanNess and the Workwell Foundation research group in America with every free copy of our clinical and research guide sent to health professionals. Some people with ME/CFS will experience true clinical depression (as opposed to just feeling ‘fed up’) during their illness. Key features of clinical depression, which also distinguish depression from ME/CFS, include anhedonia, feelings of guilt or worthlessness, being tearful and having suicidal thoughts or intentions. A significant number of people with ME/CFS are being given inappropriate psychiatric diagnoses by their doctors. The explanation for depression probably involves a combination of endogenous factors (i.e. disturbances in neurotransmitters) and reactive factors (i.e. psychological distress associated with problems connected to work, education, doctors, benefits, family commitments, etc.). A comprehensive mental health assessment, possibly involving questionnaires such as the Primary Care Evaluation of Mental Disorders (PRIME-MD), should be carried out in patients who have co-existent psychiatric/psychological symptoms. It should, however, be noted that results from mental health questionnaires need to be viewed with caution (Farmer et al 1996) and that formal tests of neuropsychological function seldom reflect the degrees of impairment reported by these patients. Suicidal thoughts, intentions or actions must always be taken seriously and queried in patients with depression who feel unable to cope. They indicate a need to carefully assess potential explanations that may include lack of social support, financial and benefit difficulties, poor symptom control, as well as any psychiatric or emotional problems that may be present. Roberts et al (2016) investigated mortality in individuals diagnosed with ME/CFS in secondary and tertiary care and reported no increase in all-cause mortality in people with ME/CFS. However, they did find a substantial increase in mortality from suicide. This highlights the need for clinicians to be aware of the increased risk of completed suicide and to assess suicidality adequately in patients with ME/CFS. We are aware of people with ME/CFS who have committed suicide, and – from contact with the families involved – while clinical depression does play a role in some cases, the reasons are often more complex and involve a combination of problems relating to inadequate medical care and symptom relief, lack of social care, social isolation and financial problems, including problems with obtaining benefits. A disability assessment scale can be useful for following progress and providing information for benefit, employment and insurance assessments. Extract from the Disability Rating Scale. ME/CFS can have a significant impact on daily living. The influential 2002 report to the Chief Medical Officer provided for four categories of illness severity: Mild, Moderate, Severe and Very Severe (Cox & Findley, 1998). 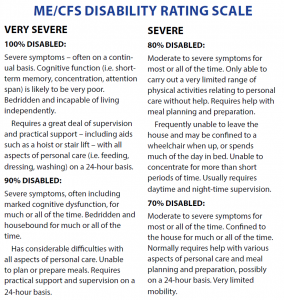 The ME Association disability rating scale is based on these categories but tries to account for the fluctuations that can occur within them. It is probably most useful when reviewing impact over a longer period, say in the last three months, rather than on a day-to-day basis. 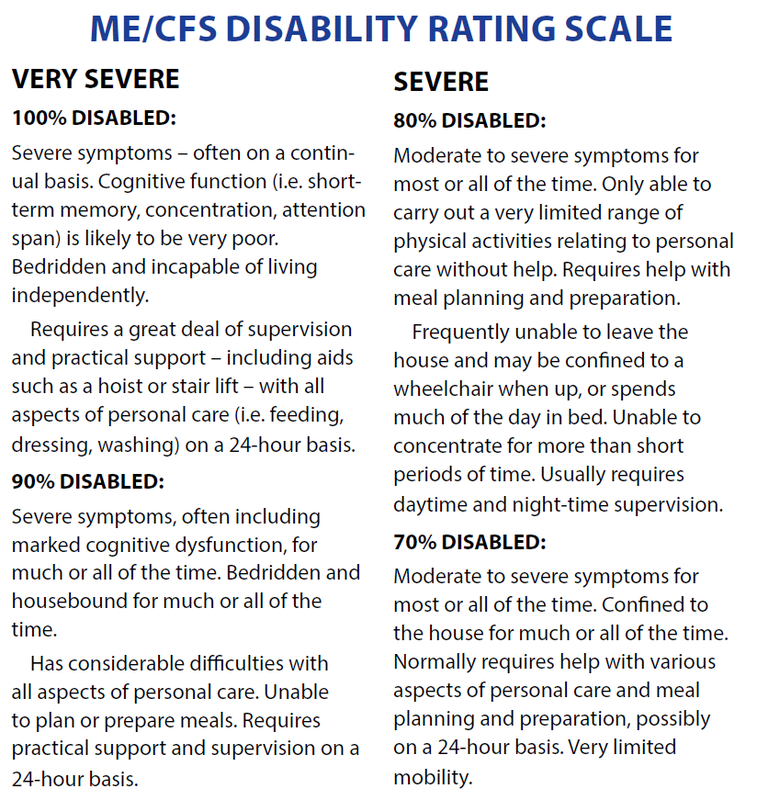 The Disability Rating Scale is also available from the website shop. It has been found to be particularly useful for clinical assessments, measuring progress, and with benefit applications – to help explain to others the extent to which ME/CFS is affecting a person’s daily life.